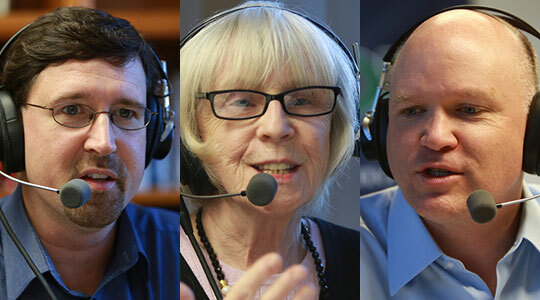 Summary of today’s show: Our Thursday panel of Scot Landry, Susan Abbott, and Gregory Tracy consider the news headlines of the week, including Cardinal Seán’s latest op-ed in the Pilot on the 10 reasons to vote against Question Two; an appointment of a new Pastor and the death of a long-serving Pastor; the 100th anniversary of a beautiful church in New Bedford; a bishop reflecting on attending the Second Vatican Council as a 35-year-old newly minted prelate; and Fr. Roger Landry’s inspiring exposition on the Sign of the Cross. Also, the second day of the WQOM Fall fund drive to support Catholic radio in Boston. 1st segment: Scot Landry welcomed everyone to the show and his co-host Susan Abbott and today’s guest Gregory Tracy. Today is the second day of the WQOM Fall fund drive. Scot said Cardinal Seán has a new op-ed in tomorrow’s Pilot that discusses ten reasons to oppose Question Two. Greg said the cardinal said in the op ed he’s heard more than 100 reasons to vote no, but he wanted to break it down and give the 10 most compelling and easiest to understand. Suicide always impacts other beyond the individual that takes his or her life. Advocates for the disabled strongly oppose assisted suicide and Question 2. Terminal diagnoses are often wrong. Question 2 is shockingly flawed. Question 2 does not require a patient to consult with a psychiatrist or palliative care expert before receiving the lethal prescription. Question 2 does not require family notification. Assisted suicide would weaken efforts to expand and improve palliative care. Complex issues like assisted suicide should be decided in a legislative process rather than a ballot initiative. Scot said there’s something in this for everyone for whatever reason they need to oppose it. Susan said it’s the beauty of this summary, whether looking at this from a faith perspective or a secular perspective. She also recommended the TV ads found at StopAssistedSuicide.org. She said her favorite of the ten reasons are 8 and 2. On number 2, we are social beings and if we think there’s anything we do that doesn’t somehow affect others, we’re deluded. It’s not all about me. Greg said number 6 is his favorite because even if someone is a complete atheist they can read this law and see the pitfalls in it. He used the example that there is no mechanism to ensure that lethal doses that are prescribed are disposed of properly is they go unused. The law lacks safeguards and clear directions. Scot said it ties in with number 10. If this was done in the Legislature, they would have made sure that the loopholes and lack of controls would have been taken care of. This is an up or down vote. 2nd segment: Scot said in the Pilot this week is a new appointment of a pastor. Fr. Dan O’Connell is moving from St. Joseph parish in Boston to Corpus Christi-St. Bernard parish in Newton. Many people know him from his long-running show on CatholicTV. Greg said congratulations to the people in Newton and said they are getting a very energetic pastor. Scot said he is one of those people who never seem to age. Scot said on other hand, Fr. David A. Doucet, who served in Stow since 2005, has passed away. He was pastor of St. Isidore parish. His funeral Mass was this week in Brighton at St. Columbkille. Greg noted that priests have lengthy lists of parishes they served, but Fr. Doucet served only a handful of parishes in his 40 years. From the Anchor this week, St. Anthony of Padua parish in New Bedford celebrates its 100th anniversary in the Diocese of Fall River. He said this church is one of the gems of New England. It seats about 2,200, the stations of the cross are the largest of any parish in the country and the statues and artwork are phenomenal. Susan said she’s seen pictures of it and it is lovely. She asked if it’s bigger than the cathedral in Fall River. The cathedral is the oldest church in the diocese and sits many fewer people. Scot related the story that when a diocese was going to be erected in the South Coast, there started a competition to build beautiful churches in the big towns by the various ethnic communities or to promote the big churches they already had. So when the diocese was formed, they went for the oldest church, instead of the largest, as the cathedral. Scot said it reminds him of how blessed New England is to have so many beautiful churches. He said in many places in the world, they would love to have even our least beautiful churches. 3rd segment: In the Pilot and Anchor this week is a story of a bishop born in Boston who was a missionary bishop in Korea who attended the opening of the Second Vatican Council as a bishop. There are few of those left in the Church and only 15 of them made it back to Rome for the Year of Faith and the 50th anniversary. Greg said Bishop William J. McNaughton gives his assessment of how the Council’s documents were implemented and how he thinks much of it was taken too far or misinterpreted. Scot said one of the responses was about the idea of moving the tabernacle to a separate devotional chapel and that it was a mistake because people have the sense of the centrality of the Eucharist. Susan said the bishop said people took some of the ideas to an extreme. People need to re-read the council documents. He said so much has come from people who have not read the documents obviously. The council was not a radical break from the past as the footnotes prove to us. She said he has wonderful insights and he rejects the arguments that the Council was somehow to blame for the decline of Catholic observance. Susan noted that the bishop was only 35 at the time. Greg said people interpreted the documents in that time which was a time of tossing aside convention and tradition. People were looking for an opportunity to take it to the extreme. Susan said it was in some case an unbridled zeal. Scot said Cardinal Seán talks about learning faith like learning to speak a language, by practicing it and immersing yourself in it. The idea in this Year of Faith is to return to those documents and to finally have that authentic interpretation of the Second Vatican Council and live it. Susan said Fr. Roger wrote a column a few weeks ago about making the Sign of the Cross and it has made a difference for her. When I was in Lourdes earlier this month, I went early in the morning to pray at the Grotto where Mary appeared to St. Bernadette in 1858. I had with me a biography of St. Bernadette and was preparing to meditate once again on the content of the apparitions and try to appropriate the lessons. I was planning to ponder what I normally ponder on the feast of Our Lady of Lourdes each February 11: the significance of Mary’s praying the Rosary with Bernadette; her having Bernadette wash her face in what seemed only to be mud, but turned out to be the miraculous healing spring; her insistence on the need for Penance; her request for a Church to be built; her self-revelation as the Immaculate Conception; and her promise to Bernadette to make her happy in the next life, not in this one. Bernadette had been prevented from making the Sign of the Cross until she had seen the Blessed Mother make it. On subsequent appearances, Bernadette would make the Sign of the Cross together with Mary and tried to imitate precisely how Mary made it with profound reverence and recollection. After the apparitions, when Bernadette was subjected to the endless line of interviews from people seeking to get her to divulge all that Mary had revealed to her, she would often be reticent about many of the details. She would readily respond, however, when her interrogators asked her to show them how Our Lady demonstrated to make the Sign of the Cross. When she became a Sister of Charity of Nevers, Bernadette continued to make the Sign of the Cross as Mary had taught her. It often brought other Sisters, accustomed to making the Sign of the Cross routinely and without much thought, to conversion. Bernadette sought to make the Sign of the Cross as she had witnessed the Blessed Mother make it: slowly, in a sweeping gesture, raising her right hand so that her fingers touched to the very top of her forehead, then lowering her hands to touch her waist, and then slowly touching the extreme of her left shoulder followed by her right. She did so entrusting herself to the Three Persons of the Trinity Whose name she would invoke, while opening herself up to the infinite graces Christ gained for us on the Cross and at the same time committing herself to embrace her daily Cross and follow Christ as a new Simon of Cyrene. Among the various things on my iPad that I had downloaded to pray at the grotto were the homilies given by the popes at Lourdes. When I began to read Pope Benedict’s 2008 homily for the 150th anniversary of the apparitions, I noticed that he spent most of his time focused on the same connection between Mary, Bernadette and the Sign of the Cross that the Holy Spirit had inspired in me earlier that morning. Most Catholics, I believe, treat the Sign of the Cross as a gesture to open and close a time of prayer, but Pope Benedict was stressing that we learn in Lourdes it’s much more than that: it itself is a prayer and one that has the capability to bring us into the fullness of our relationship with God if we pray it well. That insight triggered in me a memory of a great Vietnamese professor I had during my one year at the Angelicum in Rome, Father Joseph Phan Tan Thanh. In all the classes there, we would start class with a prayer, but normally we would either invoke the Holy Spirit, say a vocal prayer like the Our Father or Hail Mary, or the professor would offer a spontaneous prayer based on what we would be studying that day. We would, of course, begin and end the prayer with the Sign of the Cross. But the only prayer I really remember 17 years later is the one Father Phan Tan Thanh would make to start and end classes. He would close his eyes and very slowly make the Sign of the Cross in a broad gesture that must have been very similar to St. Bernadette. The first time he did it, my fellow students and I thought he “forgot” the prayer. Then we realized not only was the Sign of the Cross his prayer, but our whole class was likewise supposed to be a prayer. As we prepare for the Year of Faith, there will be lots of events, programs, educational materials, pilgrimages and more to help us live it well. All of these will be good and useful. But when Mary appeared in Massabielle to Bernadette to help her and through her others to grow in faith, this model of the Church’s faith started by helping Bernadette learn how to pray the Sign of the Cross well. For the rest of her life, Bernadette taught this lesson to others until she made her last devout Sign of the Cross just before she breathed her last. Making the Sign of the Cross with faith, love and reverence might be a great place for all of us to start the Year of Faith as well. Father Landry is Pastor of St. Bernadette Parish in Fall River.